Ramadan is an auspicious month for Muslims, and it was during this month that the Quran was revealed to Prophet Muhammad (pbuh) setting the tone for a new beginning for people of the land. On the other hand, July 4 set the tone for a new beginning for America. Both events were springboards for the mankind in social and political developments. Perhaps this is the first time in American History that Muslims will be celebrating July 4 during the month of Ramadan fully conscious of being Americans. Of course Ramadan and July 4 have crossed in 1981, and every 33-34 years before that, but without public awareness. Let this July 4 of 2014 be a historic beginning for American Muslims, where they will put together a clear agenda to be participants and contributors towards the well being of America. To be a Muslim is to be a peace maker, one who seeks to mitigate conflicts and nurtures goodwill for peaceful co-existence of humanity. Just about every activity of Prophet Muhammad (pbuh) was powered by this dual element. Our Mission is to work for a world of co-existence through inclusiveness and participation. As a member of diverse family of faiths, our efforts will be directed towards justice and equity to attain peace for the humankind with a firm grounding in commonly held values. We cannot have advantages at the cost of others. Such benefits are temporary and deleterious to lasting peace. We believe what is good for Muslims has got to be good for America, and vice versa, for the goodness to sustain. God created an integrated and interconnected world in harmony and balance, and all he wants from us is to maintain that balance. That is simply the God's will. 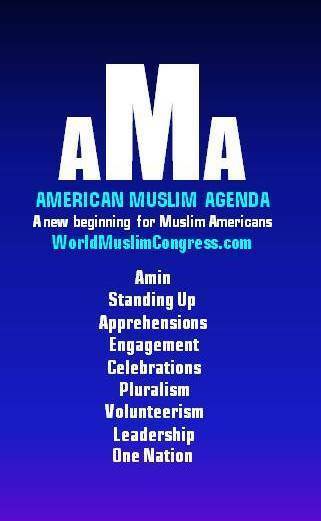 The World Muslim Congress, a 12-year-old think tank, has worked on presenting an "initial agenda" for Muslims in America based on Quran and Prophet Muhammad's (pbuh) guidance. We hope this will spur debates, followed by discussions and emergence of a Muslim agenda within the framework of American Agenda. Due to the length of the plan, it is presented in three installments. This is the foundational value of Islam, the very first step in creating cohesive societies where no one has to live in apprehension or fear of the other, trust is the glue that binds and ensures smooth running of the societies. Prophet Muhammad (pbuh) was divinely guided to set up the model of Amin based on this principle. Amins is the one who is trustworthy, tells the truth, has immense patience, who is just, and whose presence makes others feel secure. Thus he was called Amin by the Jews, Christians, Pagans and others during his life time. What does this mean for Muslim Americans? It simply means we have to become Amins of the society, and have to be there for our neighbors in their crises, deaths, marriages, birthdays and other celebrations and commemorations. Islam does not shut us down, it frees us up. There are over 18 verses in Quran where God consistently talks about taking care of fellow humans. Indeed the Prophet (pbuh) had said it in so many different ways that an irreligious guy who takes care of his neighbor earns God's grace over the guy who is relentlessly praying. For example, "None of you is a believer if he eats his full meal while his neighbor hasn't anything." (Musnad) and, "None of you have faith until you love for your neighbor what you love for yourself" (Sahih Muslim). Here is the bottom line. We need to have comfortable working relationships with everyone from Atheists to Baha'i, Buddhist, Christians, Hindus, Jains, Jewish, Native Americans, Pagans, Sikh, Wiccan, Zoroastrians and every one in between including fellow Muslims of different denominations. We should not be dumbfounded when it comes to the right knowledge about others, preferably as they express it and not what is dished out about them. We ought to take pride in knowing all of God's creation expressed in different faiths and traditions. Quran 49:13 says that God has created us into different tribes, communities and nations, and expects us to have conflicts, and then says, the best among you are the ones who know each other, indeed, knowledge leads to understanding and understanding to acceptance and appreciation of God given uniqueness of each one of us, and when that happens conflicts fade and solutions emerge. The very first guidance from God was to learn! Prophet Muhammad beefed it up by saying, learning is a primary duty, and if you have to go to a far-off land (China) to learn, go for it. Can we be the Amins? Yes, we can, indeed we cannot be a Muslim without being the Amin. What does it take? We don't have to go to far-off lands, we can learn it in our Friday Sermons, we should pound on this message, and the board members of the Mosques be required to serve in public non-Muslim and non-profit organizations to understand this model of the Prophet. These organizations ought to focus on building the value of Amin and hold "Amin competitions" in their annual conferences rather than Qirat (Quran recitation) competitions. This should be our #1 priority to be fully participating members of the society to create a cohesive America for us and our future generations. We should go with a 10-year plan, at the end of which, when a Muslim in a public square says "Allahu Akbar" it should not cause panic, instead people should gather around him, because he is expressing humility and not a shout to kill someone. When a bearded man boards the plane, people ought to greet him because they know he is Amin trust worthy, kind and gentle. When we become Amins first, our prayers, our beards or ethnic clothing in public will not frighten anyone. This is an opportunity for Muslims to contribute towards a cohesive America. If we don't stand up for others, why should anyone stand up for us? Prophet Muhammad was clear -- when you see injustice to fellow humans, the least you can do is to speak up. There is a lot of wisdom in those words and clearly goes towards building a cohesive America. Let's believe in our own words, Prophet Muhammad was not for Muslims exclusively, he was for the whole humanity and let our actions match our words. In 1776, Thomas Jefferson wrote the opening of the United States Declaration of Independence, "We hold these truths to be self-evident, that all men are created equal, that they are endowed by their Creator with certain unalienable Rights, that among these are Life, Liberty, and the Pursuit of Happiness. ..."
Way back in the year 632, Prophet Muhammad delivered his last sermon, "All mankind is from Adam and Eve, an Arab has no superiority over a non-Arab nor a non-Arab has any superiority over an Arab; also a white has no superiority over black nor does a black have any superiority over white except by piety and good action." Indeed, there is no compulsion in matters of faith" (Q2:256) one is free to believe in the pursuit of his happiness. Prophet Muhammad was perhaps one of the first significant leaders in the world, to have stood up and spelled out the rights of women from initiating marriage, and divorce to owning her own property and business, this was unprecedented liberation of women. She was even given the freedom to even disobey and divorce her husband if he were to compel her to believe otherwise. Of course, a majority of Muslims believe in that, but need to stand up against the blatant violations against women's rights including respectful space for women in the Mosque and civic organizations. We must publicize our corrected stand on the Quranic verse 4:34, which has been misinterpreted by misogynic scholars of the past to "beat the wife" to "separation" when there are disagreements. Of course it is a men thing, but it should not be religiously sanctioned thing and it is not. To ensure that all men (men and women) are equal, we have to stand up for the basic human rights of fellow citizens, regardless of their race, religion or sexual orientation. If some on violates the rights of Jews, Christians, African Americans, White, Black, Atheist, GLBT, Native Americans we need to stand up for their rights. The least we can do is to speak up. When we stand up for the rights of each other, all of us would be contributing towards building a cohesive America, where each one of us will feel safe. For Muslims it is a fulfillment of dual duty to the Founding fathers of our nation and teachings of Prophet Muhammad (pbuh). There are still a few people around us in our neighborhoods who are afraid of Muslims. Let's do our dharma and assure fellow Americans that our agenda is same as theirs, and that is to build a secure, safe and prosperous America. Unfortunately, a handful of Muslims among us have gotten us a bad name. Every time someone does some wrong, we sigh, and some of us even pray that the wrong doer was not a Muslim. We need to get out of that mode of being apologetic for the acts of criminals; they are our common enemies (Boston-Huffpost). Whoever hurts any one of us Americans, it is as if he has hurt us all, and this ought to be communicated. Indeed, "Let this be clear, together as Americans, we stand against extremism, violence and terrorism." American Muslims and Muslims around the world are sick of the misguided Al-Qaeda, and Brotherhood types of groups, and they will be the first ones to report any inkling of such men in our midst, indeed per the FBI bulk of those bad guys were turned in by Muslims. The American Muslims have no sympathy for cold blooded murderers and maligners of Islam. Sharia Phobia -- It is indeed a phobia, because it is perceived as a threat to our lives. Let it be also known that American Muslims stand opposed to the kind of Sharia "that is prevalent in a handful of Muslim majority nations across the globe". No Muslim organization in America has asked for it, none whatsoever. There is a dire need to communicate the difference between Public and Personal Sharia; personal Sharia is a relationship between God and individual and all Muslims live by it. Fellow Americans need to understand it as well. I will be the first one, to stand up against "Public Sharia", which needs to be fixed elsewhere, and does not exist in America, nor is it sought. Sharia for personal use to square off personal conflicts must be a personal choice, just as Jewish Sharia exists to settle marital and moral conflicts among Jews. Let it be known that Americans Muslims have placed their trust in American Justice system and will continue to seek justice though it as every American does, and the law of the land is our law. There is no substitute for it. In the next article, we will cover July 4th, Engagement, Celebrations, and Pluralism. The last article will conclude with Volunteerism, Leadership and gear up to building One Nation. Mike Ghouse is a Muslim speaker, thinker and a writer, and presides over the World Muslim congress, a think tank, and a forum with the express goals of nurturing pluralistic values embedded in Islam to build cohesive societies.